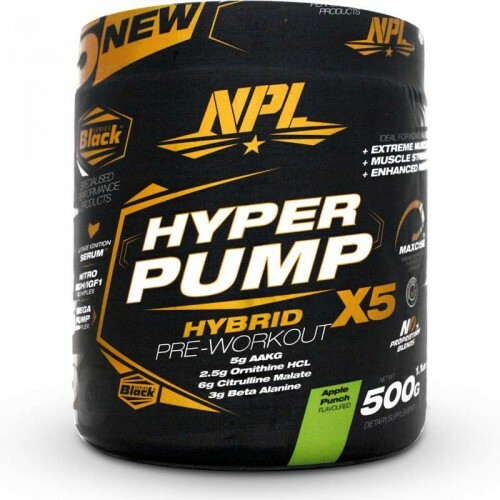 NPL Hyper Pump is a premium preworkout drink for extreme workout energy and performance. This product will take your training to the next level. Fitness athletes train at high intensity to maximise their muscle gains. Two scoops of Hyper Pump has 300mg of caffeine which together with other performance enhancing stimulants is designed to skyrocket your gym session. Made for lifters experienced drinking preworkouts. Caffeine is also known to improve attention and mental sharpness. Maximising the ‘mind-muscle connection’ to give 100% focus on the muscle being trained during a set is what creates champions. Optimize your time in the gym by removing unnecessary distractions. Increase your strength during your workouts and be able to perform at your peak during the entire session. Lifting heavier weights builds more muscle. Formulated with a 2:1 ratio of AAKG / L-Ornithine amino acid in a precise therapeutic dose to increase natural growth hormone. Recent data demonstrates the importance of increasing blood flow to the muscles being trained for better recovery and growth. The Mega Pump Complex is designed to improve blood flow and muscle pumps during exercise. NPL Hyper Pump is part of the premium Black Series range which aims to give athletes unrivalled sport supplement quality. * % NRV - Nutrient Reference Values for individuals older than 4 years. L-Arginine Alpha Keta Glutarate, L-Citrulline, Beta Alanine, L-Ornithine HCL, Creatine Monohydrate, D-Malic Acid, Taurine, L-Carnitine Tartrate, Flavouring, Beetroot Extract, Caffeine Anhydrous, Anti-caking Agent, Sodium Bicarbonate, Dextrose, Salt, Tri-sodium Citrate, Sucralose, Advantra Z 6%, L-Tyrosine, Vitamin C, Grape Seed Extract, Potassium Phosphate Di Niacin, L-Theanine, Vitamin B6 HCL, Colourant (E122). • Mix 2 level scoops (25g) with 300ml of cold water. • Individuals sensitive to stimulants should start off by using half a scoop. • Drink 15-20 minutes before training. • Do not exceed more than 3 scoops within a 24 hour period. Consult your doctor prior to use. Not intended for use by persons under the age of 18. Do not use if you are pregnant or nursing unless prescribed by a sports physician/dietitian. Maintain an adequate state of hydration while using this product. Insane pre-workout, I gym at 5am and this helps me get out of bed and into a great gym session! this is my first pre workout that i use so i use a half dose and this stuff is super strong.. after 20 minutes when i drank this pre i got super focused and my energy was the best.